I don’t talk about music much in this blog. I guess that’s because I started this blog to motivate myself to do the creative things I was not doing and music is the one creative pursuit I never abandoned. Music has been a constant source of joy and connection for me since I was a child. I grew up in a house filled with music. When I was a teenager, we took it on stage for the first time at the Florida Folk Festival. About that same time, I wandered into a chorus rehearsal during my unstructured time at a new high school. Someone put music in my hands and I was instantly hooked. I love vocal harmony with a pure and ever-present passion. Music fills my life with light. It is the one thing I can count on to get me through the dark places. I am remembering that now because this past week has needed extra light. I lost two family members since my last blog post. One was my nephew’s wife and the other was my sister’s ex-significant other. Both were taken out by cancer, the woman after a long battle and the man after a shockingly short one. When I was trying to decide whether to list him as “friend” or “family” I remembered that he had been in the circle around my mother’s deathbed in 2003. He helped us sing her to her rest. Definitely family. It’s what we do in difficult times. We sing. I imagine we would fall apart if we didn’t. We sang at my father’s funeral. I will never forget my mother standing in the front of the church, singing my father’s favorite song, a tearjerker called “Last Farewell”. There was not a dry eye in the church, except my mom’s, because she needed to keep it together to sing that song for him. It was probably the hardest thing she ever did, but music was her strength and it carried her through. When her own time came, my brother found her unconscious and she was rushed to the hospital. The family began to gather, but my older sister lived seventy miles away and it took her a while to get there. Mom waited. She did not regain consciousness, but her monitor showed life signs until my sister arrived and we gathered around to sing her one last song. When it was done, the lines on the monitor went flat. She was just waiting for her song. That night, I was scheduled to play Sister Berthe in a community theater performance of The Sound of Music. The show went on. My cast mates were shocked that I showed up, but that’s how we cope. We keep on singing. We do what sustains us. This week, we will do it again. We will gather, we will hold tight to each other and we will sing. It’s what we do. It gets us through. Rest in peace, Sandra. Rest in peace, Ron. I know we’ll meet again in a bright place filled with song. This entry was posted in Uncategorized and tagged coping, difficult passages, grief, music, vocal harmony on September 17, 2014 by releaf1954. This is starting to look like a series. 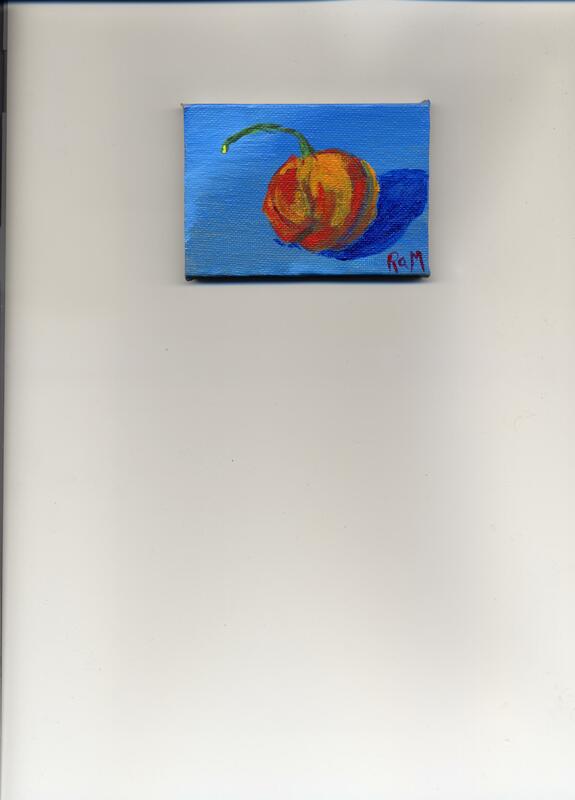 Last week, I was looking around for something to paint and my eye finally fell on a cute little habanero pepper my husband had recently harvested. It was something I could paint quickly. That was important, since I had put off writing my blog post, hoping I would have a painting to write about, until after suppertime on Wednesday, which is my blog day. 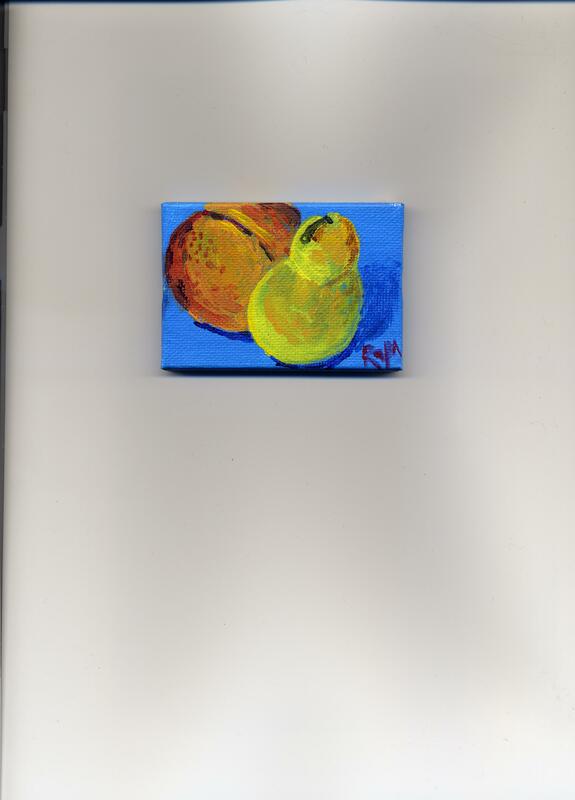 I painted an itty bitty painting and shared it in my blog post and hoped I would be moving on to something bigger – maybe even something painted on a day other than Wednesday. Okay, so that didn’t happen. I’ve been having a lethargic week and the weather has not been helping. There’s a low off the coast of Florida that’s been bringing us rain, rain and more rain. This is not cheerful weather. It’s certainly not plein air weather. I still have a dream of painting outdoors, but I’d like to do it on a sunny day, or at least a day without actual water falling from the sky. So here it is Wednesday again and I was looking around for something to paint again and there on the kitchen counter was another pepper. My husband is really proud of this one. This is the first time he’s ever grown a Ghost Pepper. These little things are so hot, they make habaneros look like sweet peppers. Seriously, they rate almost double on the Scoville scale. These are demonic little peppers. If you ask me, they even look evil. Look at that shape, so much longer and sharper than the habanero. It even has little points all over it. It’s evil, I tell you – eeeeevil! Of course, I may be projecting. It unnerves me to realize we have these things growing in our back yard. 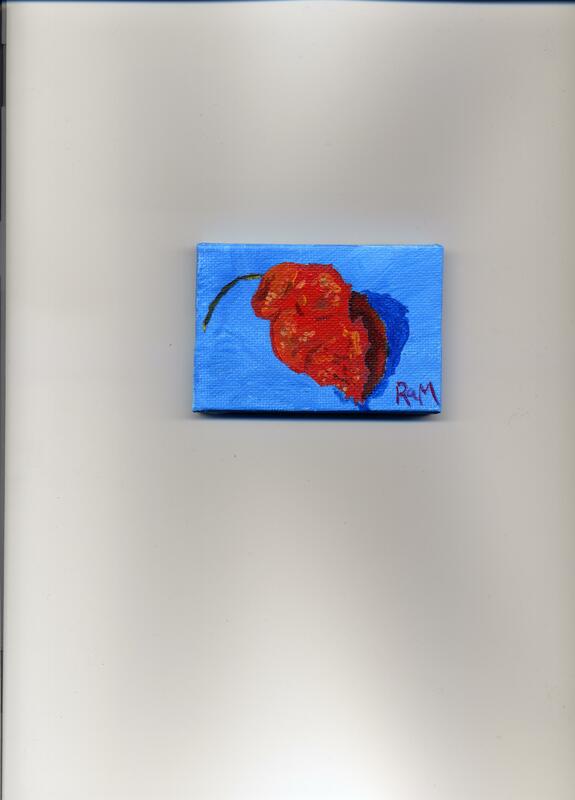 Anyway, I have another itty bitty pepper painting. Maybe next week, I’ll do something different. 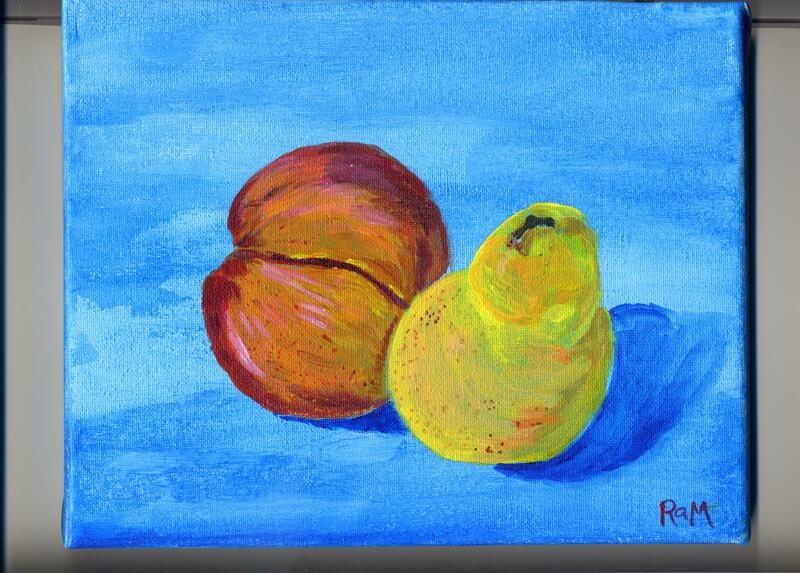 Maybe the rain will stop and I will paint outside. Maybe I’ll find some other sort of pepper growing in my back yard. Or a carnivorous plant from outer space. This entry was posted in Uncategorized and tagged creativity, ghost pepper, painting on September 10, 2014 by releaf1954.